Earthquake and Tsunamis Strike Japan! A Call for Prayers! ~ The Toronto Hare Krishna Temple! 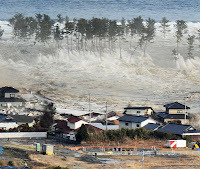 Earthquake and Tsunamis Strike Japan! A Call for Prayers! An 8.9 magnitude earthquake off the coast of Northeast Japan spawned a ferocious tsunami that's caused massive destruction; flattening whole cities, starting raging fires, and killing hundreds. Nearly 88,000 people are reported missing, according to the official Kyodo news agency. "The Tokyo ISKCON Center and Govinda`s Restaurant did not get impacted - says Sanjay Krishnacandra Das, Tokyo Krishna-devotee - apart from some cracks on the walls, there was no substantial damage." The 30 temple resident devotees are safe, they make sure to watch for the emergency evacuation instruction in case of a violent after-shock. ISKCON News will keep readers updated about the situation Japan.